Series – How to Pick the Best Heliskiing #6 - Lodging and Food, Beware of Heli-Belly! Series – How to Pick the Best Heliskiing #6 – Lodging and Food, Beware of Heli-Belly! 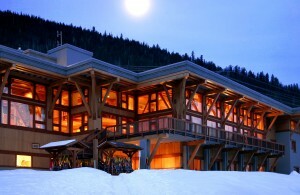 Most BC Operators offer very nice lodges in remote locations. A few offer less expensive options, including hotels, especially those that cater to day-trippers. Some offer private cabins and central dining areas. Most will offer excellent amenities including bar, hot tub, wireless internet, ski shop, massage, pool, TV/movies, etc. Some have full-blown spas. Some have gyms. The lodges vary widely. It is best to talk with someone who has been there, stayed there. (Like us!) Some are so remote that clients must fly in by helicopter. Others are right by the road or in town. Destination heliski operators almost all offer great food and lots of it. Hotel based operations may be a little less gourmet. Some of the bigger operators do buffet style, but the food is great. It’s not uncommon to gain wait on a heliskiing trip. 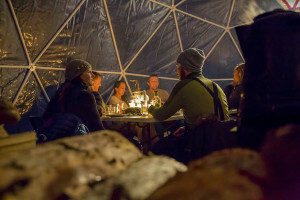 The food is so good, and often so rich, that clients (and guides) run the risk of heli-belly! Alaska is considerably more rugged, with a couple of exceptions. The center of gravity is Valdez. Most operators shuttle clients back and forth from their motel in Valdez. A few have their own accommodations. Another interesting option in Alaska is a motor home. The operators make it easy to hook up and hang out. Activities include ski touring, cat skiing, resort skiing, fishing, snowmobiling, sea kayaking and more. There are lots of great choices. Let us know if you want our opinions.